This new result, which appears online this week in Ecology Letters, came from applying the latest tools of genome sequencing and analysis to preserved evidence from experiments carried out at Notre Dame in the 1990s. The research focuses on the fruit fly Rhagoletis pomonella, or “apple maggot,” a North American native that lays its eggs inside the fruit of the hawthorn tree. 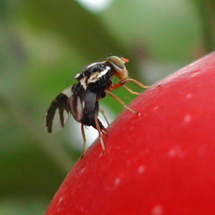 In the 1850s, a splinter group of Rhagoletis began laying eggs in apples in upstate New York, a move that required the flies to adapt the timing of their annual egg-laying cycle to match the fruiting time of their new hosts. The two populations are also known to interbreed. In a given year, about 5 percent move between populations. For Egan and other biologists who specialize in studying the process of speciation, continued “gene flow” between the divergent populations raises significant questions about whether and how R. pomonella may eventually evolve into two species. To get a sense of how quickly the two populations diverged genetically, Egan and colleagues from Notre Dame, the University of Sheffield in Great Britain, the University of Florida and Kansas State University conducted the most extensive genetic analysis of R. pomonella yet undertaken. Borrowing a page from criminal forensics, the team applied the latest tools of genomic science to experimental samples that had been preserved in a freezer at the lab of Notre Dame biologist Jeffrey Feder since the mid-1990s. At the time of the initial experiment, genetic technology allowed Feder and colleagues to study only a handful of changes across the genome. “We collected flies from native hawthorn trees, divided the flies into two groups and raised the flies under haw- and apple-like conditions in the lab,” Feder said. By raising the ancestral population under both conditions, Feder and colleagues experimentally replicated the host shift observed in New York in the 1850s. In 2012, Egan and colleagues sequenced a portion of the genome for individuals from the earlier lab experiment and measured the differences between individuals that had been raised under haw- versus apple-like conditions. The team compiled a database of more than 5 billion nucleotide base pairs to examine the genetic differences between all the populations. Of particular interest were the sites across the genome where the DNA sequences differed from one population to the other at a single site. This type of genetic variation within a species is called a polymorphism, and “single nucleotide polymorphisms,” or SNPs, are the smallest unit of polymorphic variation. 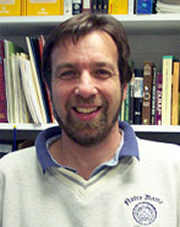 “The changes observed in both experimental and natural populations of R. pomonella underscore the importance of ecological selection at early stages of divergence and call for further integration of studies of speciation and genome divergence,” Kansas State University’s Greg Ragland, co-lead author of the study, said. For example, when the team compared the genetic changes from the “selection experiment” with the genome-wide differences between apple and haw populations in nature, they found striking similarities. Specifically, the direction and magnitude of the 32,000 SNPs were similar to the observed differences between the ancestral and divergent populations in nature. “By combining genomic data from experimental and natural populations, we were able to quantify the total genome-wide impact of selection,” Feder said. Egan said previous research on R. pomonella provided other clues as to why the genetic shift was so widespread. For example, the traits that were under selection in the move between host plants involved many genes. In addition, R. pomonella has high levels of within-population genetic variation upon which selection easily acts. And finally, R. pomonella is more susceptible to the impact of divergent natural selection because its genome contains several “inversion areas,” regions where DNA sequences are broken and realigned in the opposite order, which increases linkage disequilibrium and the total impact of selection. The study was funded by Rice University’s Huxley Faculty Fellowship in Ecology and Evolutionary Biology and by the University of Notre Dame’s Advanced Diagnostics and Therapeutics program and Environmental Change Initiative. Study co-authors include Lauren Assour, Glen Hood and Scott Emrich, all of Notre Dame; Thomas Powell of the University of Florida; and Patrik Nosil of the University of Sheffield. The Ecology Letters paper is available online here. Originally published by William G. Gilroy at news.nd.edu on June 17, 2015.